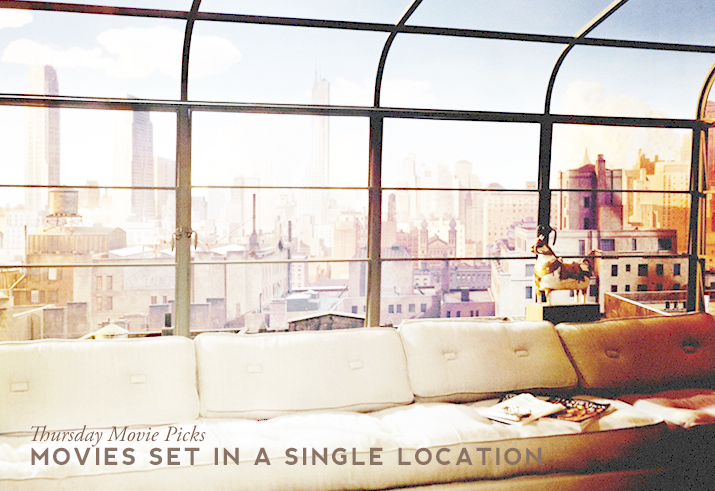 This week’s Thursday Movie Picks asks us to pick three movies entirely set in one location. Various directors have tried to do it, and some even more then once – like Alfred Hitchcock who to my knowledge did it thrice! Sometimes it’s just a technique, other times the spacial limitation serves a concept, but it is always a challenge that few excel at. Aside from the three movies I picked, others like Repulsion, Rear Window, Dog Day Afternoon, Locke and Moon are also great movies set in one place. Two young men murder another, hide his body in a chest in the middle of their apartment’s living room, and casually proceed to host a dinner party. It’s as simple as plots go. All the tension that follows comes from the prospect of James Stewart’s character, one of the guests, finding out about the killing. As a story, I much prefer Rear Window – the suspense is sky-high for me on that one – but Rope is a lesser known prodigy of editing, or rather, lack of it. It has solely ten cuts, five of which are sort of hidden as to not disrupt the narrative flow. At times the camera moves around as a wandering guest would, and other times it mimics the eyes of a character, seamlessly, from just one side of living room, as if we’re watching a play. It’s set in real time, too – all of which creates an immersive effect for the audience, which Hitchcock mastered and loved. Read this for more on Rope. Where to start with Funny Games? I’ve written a rather long post about it already, yet it still feels like I’ve barely scratched the surface of a film that is, for so many, pointless. Something that always baffles me, because everything in this movie is there precisely to try and prove a point. Again, a simple premisse: a family (a couple and a boy) that just arrived to their summer house is visited by two young men who refuse to leave. They bet on whether the family will be alive at 9AM the following morning (against it, of course), and spend the night playing sick torture games with them. There’s no background or character development, just three people suffering, and two psychos enjoying the infliction of pain. It could be the plot of a horror movie, but instead it is more of an experiment where the audience is the subject. In Funny Games, Haneke critiques violence in the media not through exposition, but by turning the camera on us. By blurring the line between watching and participating, the film forces viewers to question why we watch and enjoy the depiction of violence on screen. Read this for more on Funny Games. 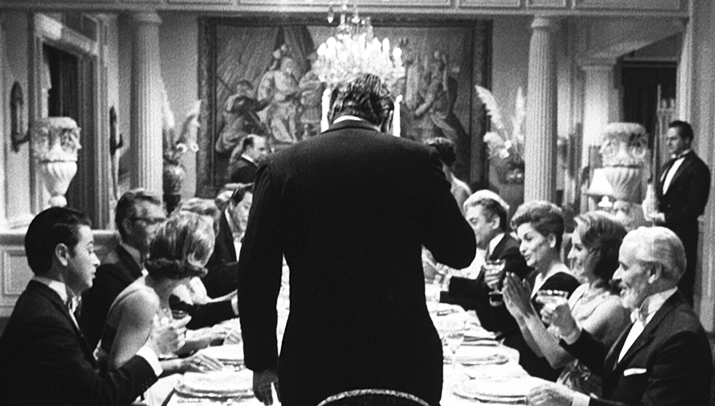 I have yet to write about The Exterminating Angel, but I have talked about it on the podcast. It is an absolutely brilliant movie by spanish director Luis Buñuel, a gem of macabre comedy with surrealist elements that is bound to perplex anyone who watches it. It has a confounding and intriguing premise: a group of guests at a dinner party find themselves unable to leave. There’s no visible barrier or force that prevents them from exiting – they simply don’t, until they realise they actually can’t. Once they do, chaos ensues, as these fine people reveal their true human, animalistic nature. Michael Pitt is such a great actor! I loved him in Boardwalk Empire! His is still one of the most striking tv deaths for me. He *is* so great, I wished he did more stuff ! EL ÁNGEL EXTERMINADOR sounds in intriguing. Rope has been on my list for ages and I will get round to this. Funny Games makes my insides twist. I haven’t seen the remake but if its exactly like the original I do not need to see it again. A horrible film that is now burned on my memory. The last look at the camera just makes me so uncomfortable. It is one of the most intriguing films I’ve ever seen, so confusing… ! 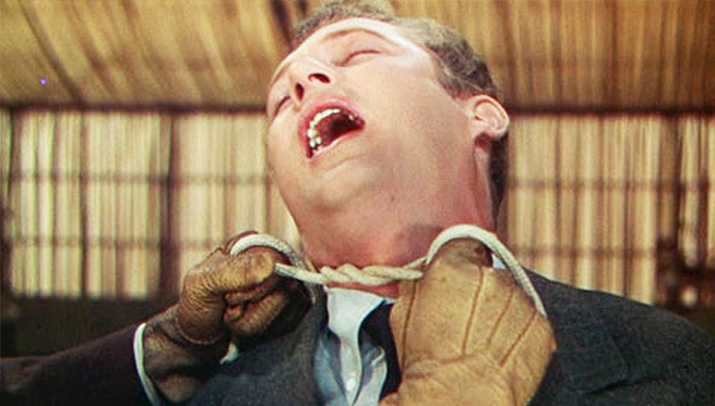 You need to see Rope, especially if you like Hitchcock. And yeah, the remake is the original frame for frame, word for word – only the acting is different. I’m starting to think I should be uncomfortable with the fact that this really doesn’t make me uncomfortable, at all, haha. I haven’t seen any of these, but Rope is so popular this week I should probably watch it. I am obsessed with Funny Games! Loved the cast of the 2007 one and it was a great commentary on violence. I feel ya, most people don’t enjoy or understand the film, it’s a shame! Oh man I hated Funny Games so much, but I LOVE Michael Pitt. I really need to see Rope. Michael Pitt is sooooo great – he needs some quality projects ASAP. I haven’t seen any of these, but it’s so fascinating when films only use a single location. Adding these to my list! I still have to see Rope and will by the end of this year. The last film sounds excellent and I would love to see it if I ever get the chance. Hi Sofia, I love this list. So glad to see you back in the blogosphere! I’m barley blogging myself–blogging about once per month now. In grad school, with a toddler, job, and husband in my late 30s is no joke! I keep hearing wonderful things about ‘Rope.’ It’s on my list to see. I was hoping it was at least as good as ‘Rear Window.’ Whenever I get time I need to get back into the blindspots. Rope is similar and yet so different from Rear Window. I guess bc in RW you’re trying to figure out if the guy really killed his wife, all the while with an element of danger to the main characters that are in our POV, whereas in Rope you’re waiting to see if a character finds out something you already know – for me, that makes a world of difference when it comes to the suspense level, which ultimately changes the whole movie experience. Regrettably, I haven’t seen any of these. I need to get to both versions of Funny Games. Rope as well. Great picks! Well I can only envy you Kevin, knowing you’re still about to experience the first watch of these movies, especially Funny Games ! It’s been so long since I saw Funny Games, I really need to rewatch it. Also, I really want to see the other two movies, I remember you talking about how much you liked them.